After a decade of cultivating the legendary Halo franchise exclusive to Xbox, Bungie decided it was time to move on. In the wake of that decision, they are creating Destiny, an open-world first person shooter that intends to be the spiritual successor to Halo while also aiming to change the genre as much as Halo did over ten years ago. And this time, they’re going not only cross-platform, but cross-generation: PS3, PS4, Xbox 360 and Xbox One owners can all get in on the action. Personally, since the game was first announced a year or so ago, I haven’t been all that engaged in it. As an introvert, I only recharge my energies when not interacting with people, so as much as I love games I am rarely interested in games focused on multiplayer. I enjoyed Halo for its epic story, eventually becoming more engrossed in the novels (particularly Eric Nylund’s) than the games themselves. I have never played a single match of Halo online, although I did play a local co-op game of Halo: Combat Evolved with my friends back on the original Xbox. When I heard that Destiny was attempting to mix the MMO and shooter genres, I figured they were finally just doing away with the story and making the multiplayer the main course. That’s about when I tuned out. While Destiny doesn’t launch until September of 2014, this past weekend the game was playable in a pre-release alpha state on PS4 consoles, for a limited engagement of three days only. 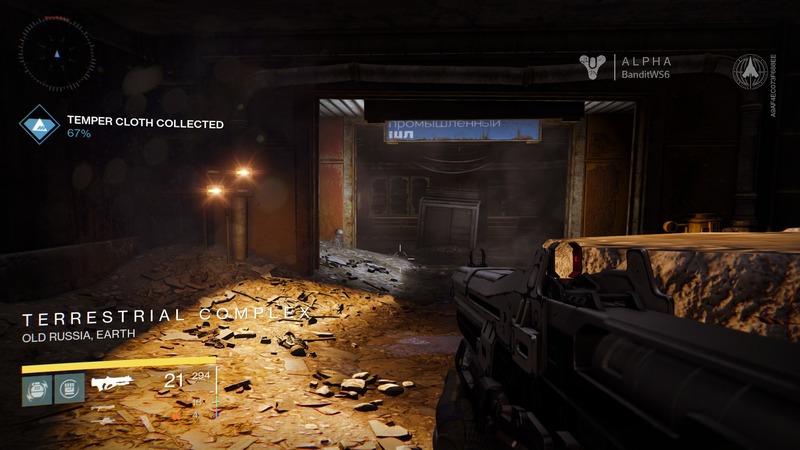 Ostensibly, the purpose of the alpha was to help Bungie conduct an initial load test of their online infrastructure with real players involved. To participate, you had to have an “alpha code”, acquired either by special invitation or by snagging one from various game journalism outlets and Twitter feeds before someone else got to them first. Friday evening, a mere hour after I had posted in a message board thread about the game saying that I didn’t really feel like it was for me, I received an invitation from Sony’s PlayStation Network to join the alpha. My very own Destiny alpha code? Why? What did I do? I still don’t know — it was probably random — but I decided that this was the perfect opportunity for me to see for myself whether Destiny would be a hit or a miss. I redeemed the code, downloaded the 7 GB alpha client to my PS4, and launched into the game world. And what a breathtaking world it was. Thus began my three unforgettable consecutive nights of total immersion in the universe that Bungie has created, three nights indelibly written in memories so profound that they transformed my very perceptions, my very approach to certain genres of gaming. Were I to try and sum up my experience, I would say that Destiny feels like equal parts of three of my favorite game series of the modern age. It has the combat made famous by Master Chief’s war against the Covenant in Halo. It has the infectious looting and gear comparison of Borderlands. And it has a mysterious and wondrous story reminiscent of Mass Effect. Bungie has assembled these elements with a level of finesse, polish and attention to detail that many studios never match even with the finished products they ship — and this is an alpha, a test early enough in a development cycle that it is often conducted only in-house. What was it that grabbed me and hooked me so completely? It is impossible to name just one thing. Indeed; Destiny is more than merely the sum of its parts. Taken as a whole, its entire universe is so compelling, so addicting, that you want to immerse yourself in every meson of it simultaneously. The game tells the story of our solar system’s distant future, a future in which humanity was visited by an extra-terrestrial being known as The Traveler, a being in the form of a small planetoid which bestowed upon us great power and knowledge, beginning what became known as our Golden Age. We expanded to almost every planet in the solar system, our technology growing by leaps and bounds. Somewhere along the line, however, another outside force known as The Darkness put a violent end to humanity’s advance, nearly wiping out our entire race in a cataclysmic event referred to as The Collapse. This event was so total and complete that scarcely anyone remembers the particulars of how and why it happened. What we do know is that the mysterious Traveler sacrificed itself to save the last vestiges of humankind, and that those few survivors have taken refuge in the lone remaining human city, shielded by the Traveler’s fading energies. And now, after years of recovery and rebuilding, the time has come for us to venture forth and revisit the now-ancient worlds that we once lost…including Earth. It is this universe that all players of Destiny share together. Together, we are Guardians — elite warrior-defenders — of a fledgling society comprised of only those who survived The Collapse many years ago. As Guardians, we are not only explorers tasked with returning to our lost worlds, but also the last line of defense against The Darkness which lurks just beyond the city walls, waiting for an opportunity to extinguish the last embers of humankind. And it’s not just The Darkness, either: in the years since we’ve been gone, our planets have become home to new and alien species, scavengers, pirates and vandals, none of whom are interested in welcoming us back home. Your first task in Destiny is to construct your Guardian, the character through whose eyes you will be exploring this universe. You have three classes to choose from: the heavily-armored Titan brawler, the stealthy survivalist Hunter, or the arcane power-wielding Warlock. In reality there isn’t that much difference between the classes, not so as you’d notice. Each class has its own distinctive special moves, its own “class item” used as decoration and a means of individual differentiation. Beyond that — at least as far as the alpha went — there wasn’t much variation. But this could be a deliberate design design made more prominent in the game’s early levels, with greater differentiation seen later as characters develop. What makes Destiny really different from the Halos and Mass Effects that preceded it is the always-on, massively open world that your characters inhabit. 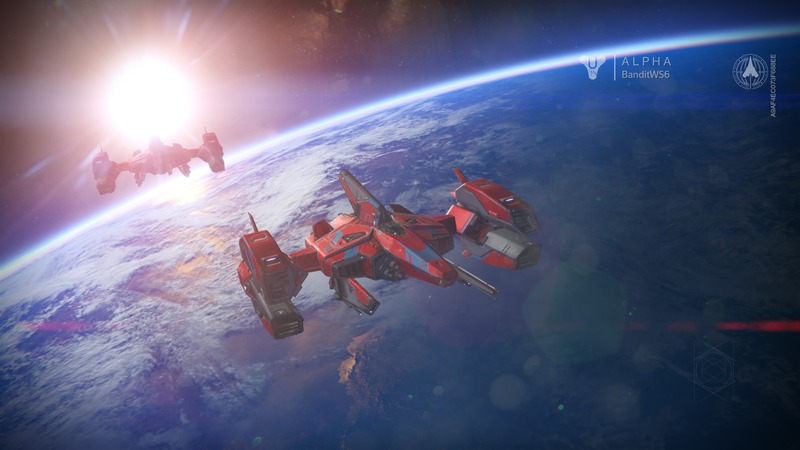 In many ways, Destiny is like a MMORPG like World of Warcraft or that ilk. Groups of players can gather together in instanced servers to take on bosses, perform raids, do story missions or even fight each other (in Player vs. Player or PvP combat). There’s also open-world exploring, where you can pick through the rubble of crumbling aerospace complexes on Earth and get into firefights with pockets of aliens, scout around for forgotten remnants of humanity’s Golden Age, or look for secrets and hidden loot. The Destiny alpha offered a taste of each one of these “game modes”, some of which even blended seamlessly together to really enhance the “one big universe” feel. Most MMOs have a social area. In Star Trek Online, for example, it was the star bases. 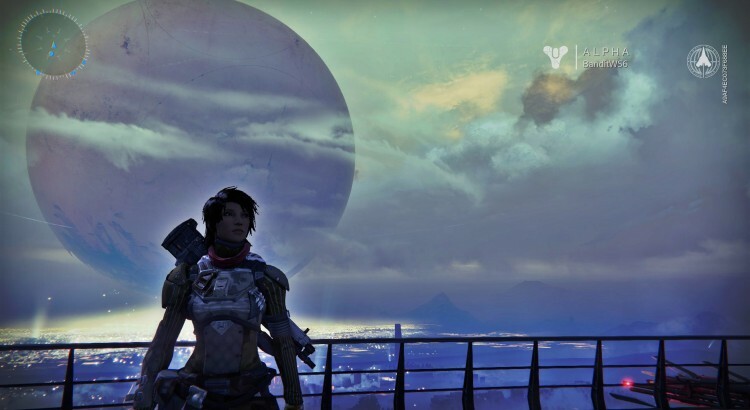 In Destiny, it’s The Tower: the Guardians’ home high above the last human city. Here, players can gather to replenish or upgrade their supplies, take on new missions or bounties, customize their character and gear, or just chat (or dance, as it happens…there was a lot of dancing) with other players. The Tower is a social hub, a place for clans to meet before embarking on a strike mission as well as a nice spot for a lone wolf player to sit for a while and gaze at the incredible landscape. In addition to loot chests and random equipment drops found as you play, you can also buy new gear here. Potentially rare or unique items can also be found in the form of encrypted engrams, a sort of data stream that can be decoded by the Tower’s Cryptarch into different forms of matter. These might be pieces of armor, clothing or raw materials, or even weapons. Combat in Destiny is at once tense, exhilarating and satisfying. Building on the two-weapon loadout that Halo made famous in 2001, Destiny takes it a step further, giving you a primary, a secondary and a heavy weapon slot. You use the triangle button (or “Y” on the Xbox controller) to switch between primary and secondary as usual, but now you can also hold down the button briefly to bring up the heavy weapon. Weapons are offered in a variety of classes: scout rifles, for instance, are semiautomatic “precision rifles” made for pinpoint shooting at medium ranges, while pulse rifles snap off a three-round burst (think Halo’s battle rifle) to drive the point home extra hard. Hand cannons are like Western-style revolvers that pack a serious punch; fusion rifles take a moment to charge but usually decimate their targets with just one or two hits; and shotguns…well, they emit a seriously satisfying bang followed by an even more satisfying pump-action racking. It’s hard to argue with that. As you wander around the world you’ll run up against all types of enemies, some of which you’ll dispatch with relative ease, and others of which will have you literally running for your life. As you level up — both your character and your weapons, most of which have their own skill trees — killing the entry-level foes becomes easier, but there are always higher-level enemies right around the corner. There were even a few baddies in the alpha whose level reported only as “? ?” and which absolutely could not be killed. All you could do was run away screaming, their guttural roars echoing off the rust-laden walls as you fled through abandoned tunnels toward freedom. Some encounters actually require you to team up with others, and it was here that I had my first transformational experience. Normally very averse to playing online with people I don’t know, I found out the hard way that Destiny makes it very easy for other players to drop into your game, all in the name of creating a seamless interactive world. Early in my alpha experience, I encountered a mini-boss event — the arrival of a giant walking spider-tank — that kicked off a 5-minute timer in which I had to destroy the beast. I wound up being destroyed myself instead, time after time. The encounter was clearly designed for more players. In my second time encountering the spider-tank, I had two other random players in my instance with me, and without so much as a word (neither of them had headsets) we proceeded to lay waste to the mechanical monster. And oh yeah, I had one other advantage that I hadn’t brought with me to my first fight: a rocket launcher. The video below, recorded by the PS4’s built-in recording feature, depicts our battle (and our “gold tier” victory achievement at the end). By the third and reportedly final day of the alpha, it was my turn to drop into another player’s instance unexpectedly. This time, rather than simply run around the world shooting at everything that moved, this player sent me a friend invitation asking me to join his fireteam. Truth be told, I had just about an hour left before I needed to get to bed and joining up with another player for an organized firefight had not been in my plan. Perhaps it was the lure of Destiny’s world that swayed me, but I accepted the invitation and proceeded to shoot and loot my way through sections of the alpha that I hadn’t even seen yet. We discovered secret caves, reawakened dead ghosts and even launched into orbit with our matching dropships. I left the alpha feeling like I might actually enjoy teaming up to take on multiplayer challenges, maybe even running with a regular group of Guardians out there once the full game arrives. What I like about Destiny is that it doesn’t swing heavily in either direction; there promises to be many parts of the game that you can play solo when you feel like exploring the wastes by yourself, while there are other parts you’ll need to be at least semi-social to succeed. The game works well as an entry-level MMO or “MMO lite” because there aren’t a whole lot of tactics involved beyond concentrated fire or distract-and-cover, which suits someone like me quite well. I live for the thrill of the adventure and the exhilaration of the fight, not for the planning, strategy or theory (all of which I am terrible at in these contexts). 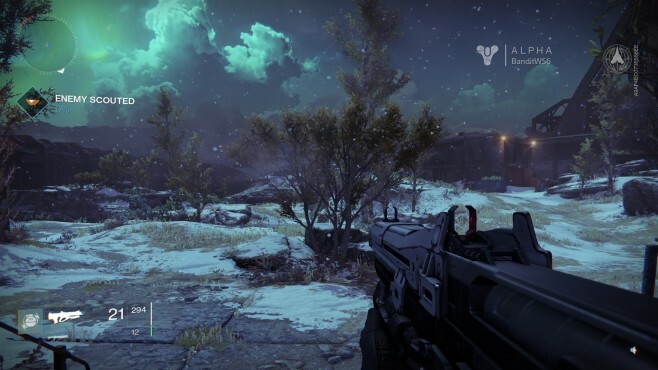 Although the alpha has ended now, Destiny will return in July for its public beta. Again, access codes will be required, but anyone can secure one simply by pre-ordering the game. Originally I had no intention of doing so, but on Sunday afternoon I pre-paid for my PS4 copy in full and have already registered my beta code with Bungie. Because after an alpha like that, there’s no way I’m going to miss the beta — or the final release. For now, I have my gameplay videos and screenshots to remind me of the incredible universe at which I received only a peek. Here’s hoping the rest of Destiny will be equally memorable.